Friendless and hunted, Tessa takes refuge with the Shadowhunters of the London Institute, who swear to find her brother if she will use her power to help them. She soon finds herself fascinated by--and torn between--two best friends: James, whose fragile beauty hides a deadly secret, and blue-eyed Will, whose caustic wit and volatile moods keep everyone in his life at arm's length...everyone, that is, but Tessa. As their search draws them deep into the heart of an arcane plot that threatens to destroy the Shadowhunters, Tessa realizes that she may need to choose between saving her brother and helping her new friends save the world...and that love may be the most dangerous magic of all. Goodreads. 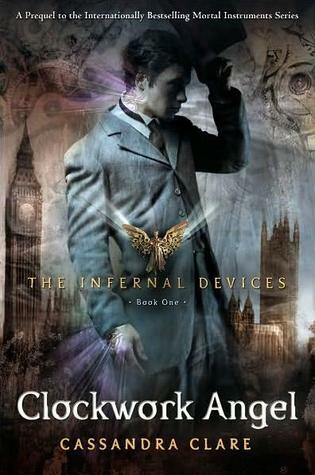 Review - Clockwork Angel isn't reinventing the wheel for Cassandra Clare but it is plowing into the world that she had created with the Mortal Instruments series. While the historical setting and the inclusion of a steampunkish storyline deviates from what she's previous accomplished there continues to be the elements that make her such a popular author - love triangle, dark origins, conflicted feelings and compelling characters. Whereas the tight familiar ties of the previous series conflict invested the audience more, the main dilemma of this narrative is distinctly inhuman and cannot be personified so there is decidedly less investment. However, the story and characters are fun company on an intriguing journey with some big questions that need to be answered. I got "Clockwork Angel" for Christmas. I started reading it a few days later around 10 at night. At about 12:45 I was all "Oh I'll just finish this bit and then get some sleep." Next time I looked up it was 5.30 a.m. I thought it was about 2 a.m at the latest. And by that point I was 100 pages from the end so I was all "Well might as well finish it." Queue me reading until 7 in the morning. So I'd totally agree about the entertainment/page turner factor in this book. And I think I actually enjoyed it more than "City of Bones". I don't know it if was the Victorian setting, or the fact that I was already familiar with the worldbuilding, but somehow it seemed neater to me, both in the writing and plot structure. I may not pick up "City of Fallen Angels" right away but I will absolutely be leaping on "Clockwork Prince" when it comes out. I still preferred the original series (can't wait for City of Fallen Angels), but I'm sure I'll pick up Clockwork Prince when it comes out. I've only read City of Bones, but I definitely plan on reading the rest of Cassie's books soon! There were definitely a lot of questions still unanswered by the end of this book!! I'm excited to get Clockwork Prince and finally figure some of them out :) Great review!